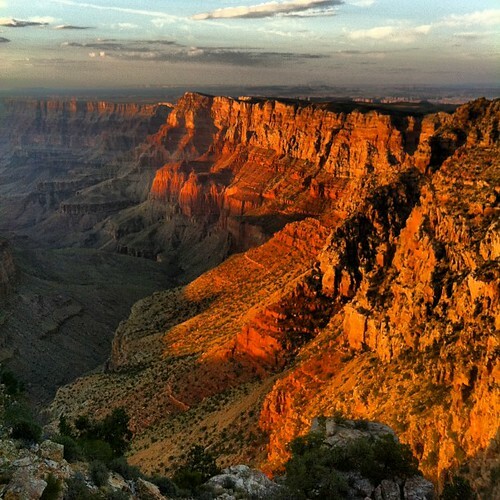 North Rim, Grand Canyon, a photo by dsjeffries on Flickr. My first trip to the Grand Canyon was just a month ago. Breathtaking doesn’t even begin to describe it, and pictures cannot do it justice. This house is well-known as “that pretty white house at 41st & Lewis” by many Tulsans. Indeed, it’s been called Tulsa’s most beautiful house since its construction in 1932. From the beautifully-manicured lawn to the graceful dormers and towering fireplaces, the house is among Tulsa’s most iconic residences. McClintock took the advice of his friend, and this stunning home is the result. I think we can all agree he made a wise decision. As I wrote last week’s post about the new ombudsman at the Consumer Financial Protection Bureau, I was submitting my complaint against Wells Fargo Education Financial Services. Yesterday, I received an email from a “research and remediation analyst” at Wells Fargo EFS thanking me for my complaint to the CFPB, and offering to work with me on a workable repayment plan. After figuring out what payment I can afford to make to Wells Fargo EFS each month, they accepted my offer. That simple arrangement could have been made over a year ago, but they refused to work with me until the CFPB got involved. I have to send a huge thank you to the Consumer Financial Protection Bureau for the creation of the ombudsman for private student loans. I’ve tried everything I know to do for over a year now, and within a few days of the CFPB’s involvement, Wells Fargo is now willing to work with me. After all the heartache, the job hunts, the packing, moving, and unpacking, contacting my congressmen, going on national radio, the letter writing, financial and legal consultations, etc., they’re finally being responsive. If they had simply done a year ago what they did today, this whole mess could have been avoided. Now I get to try and repair the damage that has been done to my credit since this situation began. Any tips on that are welcome. Another big thank you goes to Elizabeth Warren for her efforts to create the CFPB. Without her leadership and persistence, the CFPB would not exist today, and I wouldn’t have been able to get Wells Fargo EFS to agree to any terms on my own. Thank you, thank you, thank you. I know this isn’t over–far from it, I know–but for now, I’m able to breathe a sigh of relief. I just saw the news a few days ago that the Consumer Financial Protection Bureau has officially launched its complaint system for private student loans. Prior to a few weeks ago, if you had problems with your private lenders, you had no place to go. Now you do! If you have private student loans and your lenders have been unreasonable or treating you unfairly, use this contact form! I read an article at Huffington Post this morning about a federal bankruptcy judge in Louisiana who ordered Wells Fargo to pay $3.1 million dollars to a homeowner for their “highly reprehensible” actions against that homeowner. The article got me thinking about the many people who’ve shared their own horror stories of dealing with Wells Fargo, and the conversation I had with the Wells Fargo representative named Cody who told me I should be thankful my student loan through them isn’t a mortgage because they would already have taken my home by now. That in itself speaks volumes, and is a confirmation of the stories friends and relatives have shared with me. It also illustrates a pattern of abuse by Wells Fargo (see below). Even worse, when I met with representatives from my Congressmen about my problems with Wells Fargo, one said, “Wells Fargo really shouldn’t be in the business of lending money to anyone, since they repeatedly show no interest in helping their own customers”. This representative then shared that they (Congress, a broader “they”) receive more complaints about Wells Fargo each year than any other bank or loan company. Considering that the representatives for my area are some of the most conservative in the country, it was quite surprising to hear those statements from their offices. I decided to see what other people across the country have to say about their experiences with Wells Fargo. A simple search returned thousands of results, a vast majority of which were extremely negative. Just browse the Wells Fargo page at Consumer Affairs to see for yourself. Of the 686 responses on that page, 81% rated their experience the lowest possible (1 star of 5). Another 11% rated it 2 stars. That’s a huge disapproval rate. Granted, it’s a website that caters mostly to complaints, so those scores are somewhat expected, but dramatic nonetheless. I encourage you to read through some of the stories people shared. Back to the search results. Scroll through the 28 pages of complaints at the Complaint Board. Or visit the Customer Service Scoreboard, where Wells Fargo currently has 784 negative reviews and only 22 positive reviews. I’ve had enough harassment. My son has fallen behind in his payments on a student loan I co-signed. We have both contacted Wells Fargo on several occasions explaining our situation looking for options. After graduating from college, he has tirelessly interviewed for jobs. He currently is working for Target Corporation, part-time, hoping to go full-time soon. In the meantime, Wells Fargo calls me 4-5 times a day to inform me that he is late on his payment. I try to explain that we have talked to a Wells Fargo representative and as soon as he gets a paycheck, he pays on the loan. I have put payments on my credit card at times to help get him caught up. I’m also paying on student loans. Finally last week I told the representative, this is enough. I’m tired of them calling. We’re doing our best to make payments. The representative got extremely rude telling me there were no other options, nor did she care about our situation. She went on to threaten me with a lien on my house and garnishing my wages. The real irony is that I couldn’t make a payment with my credit card because Wells Fargo lowered my credit limit because of the late payments on the student loan…so I couldn’t pay if I wanted to. My credit card is maxed out. When I suggested that other companies offer payment options, she replied, “We are not other companies!”. I have since moved all of my accounts out of Wells Fargo including my home mortgage. It almost appears they are hoping we fail. When I asked if she preferred if he defaulted on his loan, she once again threatened me. This has been going on for months even though he’s only behind by $750.00. Everyone getting screwed over by Wells Fargo needs to write their congresspeople! It’s great to share your stories online but in order to gain traction, all of us need to band together and get in touch with legislators. Alone, there’s not much we can do, but working together, and with our representatives, we may be able to accomplish something. Not only for ourselves, but to prevent these types of things from happening in the future. A while back, I posted about Discover Student Loans offering me a 2% graduation reward on my account. Well, I checked my account today and noticed my current balance was lower than I thought it should be. I looked at my account history and they applied that 2% reduction in my principal within two weeks of my accepting it! So I’m sending my thanks to Discover Student Loans. They’re operating in a way that Wells Fargo only wishes they could. They actually value their customers and treat them right. I’ve had a number of my photographs stolen from Flickr over the past four or five years; in fact, it’s more than I can count. This list includes urban planners working on Tulsa’s new comprehensive plan and officials on public boards of directors to (most recently) magazines and PR/marketing agencies. These individuals and organizations illegally downloaded or captured (in a simple keystroke) my photos and then used them without permission or compensation. I don’t have the best equipment (it’s expensive!) but I still make beautiful works of art simply by my use of light, color, framing, angles, et cetera and they’re obviously desirable. I think it’s great that people are noticing my photos, and I’m flattered that so many people like them. In fact, I’ve been published in many magazines, journals and newspapers, along with special publications through the Oklahoma Department of Tourism and the New York City Department of Transportation. One of my photos of Times Square was even used in a graphic novel a few years ago. Individuals and companies have sought out my photos of Tulsa to display in their offices and homes. So what’s the difference? All those publications and individuals respected my rights as a photographer. They first asked if I would license my photos, and then would pay me for my work. Both parties sign a license agreement, files are transferred (or printed), then I receive a check and a copy of the issue the photo will appear in. It’s easy, it’s the right way to do things, and it’s the law. That’s right; using photos without permission is against the law. It’s a violation of intellectual property law, which covers everything from technology patents to photos, paintings and other original works. If you violate my copyright, I have the right to pursue a lawsuit, and I’m good at finding my photos that are being used by other people. People often ask, “how do you know they’re using your photos? How do you know it’s yours?” It’s the same as identifying one’s child in a playground… You know because it was once part of you. The lighting, the colors, the street life, the reflections in windows, and yes, the smells, were all experienced by the photographer, and as the shutter is pressed, that singular moment in time is captured and will stay with the photographer forever. Add to that the time it takes to process each photo, upload it, tag it with keywords, geotag it, name it and save it, and it’s easy to see how a photographer can know exactly which photos belong to them when they’re used on other sites without permission. Even though I have 12,000 photos online (and four times that amount that remain unpublished), I can still tell you about each one; exactly where I was, how the scene made me feel, where I was going next. Bottom line: do not steal photos from the Internet. Don’t even think about it. It’s wrong, it’s illegal, and you know better. Posted on April 9, 2012 Categories UncategorizedTags copyright act, copyright law, copyright violation, daniel jeffries photography, photo thief, photographers' rights, photography, plagiarism, stealing images, stealing online photos, theft, tulsa photography1 Comment on Don’t Steal Photos Online!